Please tell us a bit about yourself: I had very red hair when I was young. The cinnamon has gone mostly salt, but the attitude’s still there. My husband and I enjoy travel, but we love coming home. Whenever I sit down at my laptop, my two cats are there to “help.” My chief addictions are reading, crosswords, Sudoku, music (singing & guitar) and baking. I enjoy quiet, and can’t stand to have the TV on all day. 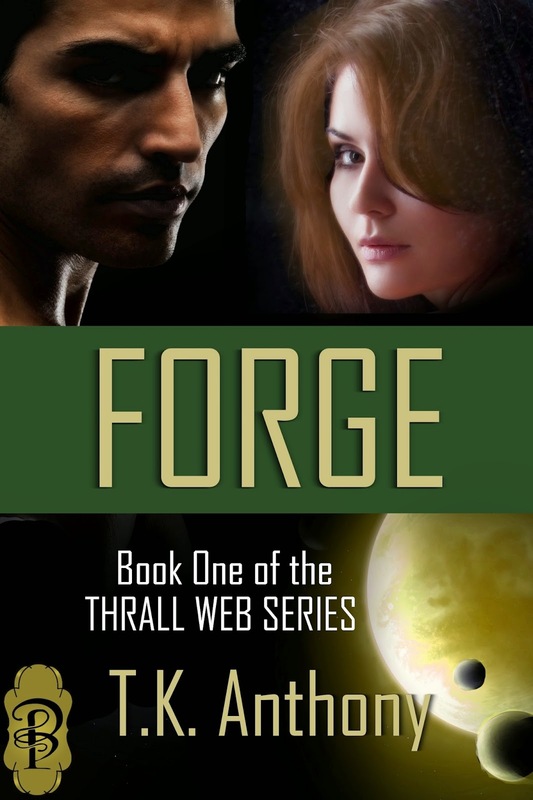 Tell us about Forge: Book I of the Thrall Web Series: Forge is epic space opera spanning worlds, and the human heart. The shared colony planet of Forge sits at the crossroads of three peoples. The reptilian folk of the Xern Cluster and the amphibians of the Tormin Accord, both mindblind races, are wary and suspicious of the psychically talented humans of the Scotian Realm. The Scotians loathe the indentured servitude—slavery in all but name—common in the Xern and Tormin cultures. Only the Scotian high king a and trusted few know of a vision foretelling the conquest of all three peoples by an unknown race of psychic predators...unless they overcome their mutual antipathy and join in common defense of Forge. When the story opens, the hero is a mindblind and amnesic “izzy,” the indentured servant of a drunken, abusive Tormin. He’s called “Tazhret,” the Tormin word for “nameless.” His memory and talent were stripped by the illegal hallucinogen scoot, but visions of chains and slavery haunt him. But there’s also one bright hope: a beautiful dream-woman who tells him he has a good name. He desperately wants to believe her, even though he isn’t sure she’s a memory of someone real, or just another product of his hallucinations. Real or vision, Tazhret loves her just the same, never dreaming they share a dark future pitting them against their Scotian high king, and the predatory psychics of the Khevox Dominion...with the fate of the three peoples hanging on the thread of their love. And when he finds his true name, and his true love...will he be willing to give it all up for something greater than himself? What inspired you to write this particular story? : I’ve always been a writer, but not a creative one. Then I hit a very traumatic time in my life. My fragile-elderly mother broke her leg one week after I got laid off. Fortunately, I had a decent severance package. Instead of polishing my shoes and my resume and taking a much-needed vacation, I took on night-nursing duties, without benefit of any medical training. In the midst of all this, I got an image in my head of someone in a lot of trouble, and wondered how he got there, and what would happen next. I poured into the story a lot of my angst—and a lot of my beliefs regarding freedom, human dignity, and the power of sacrificial love—along with my awe of my mother’s heroism in battling through a lot of pain back onto her feet, when she could have just given up. “Endurance” shows up a lot in Forge. She’s the reason. Her Scots heritage is the reason why my heroes are Scots, too. Please share a favourite snippet from your book: In the aftermath of his rescue from his Tormin master, Tazhret begins to heal physically, but still can’t remember his name, so he goes by “Ian Smith.” I loved writing this scene, where Ian finally discovers his dream woman isn’t a hallucination. He was warm and comfortable. Comfortable. Ian stirred a little, nestling down into a soft mattress, under a cozy blanket. So much better than staying out in the stables with the horses. He tried to roll on his side, but something secured him on his back, a blanket snugged about him. Ian opened his eyes, looked down at the restraints over his chest, stomach, and legs. Somewhat perplexed, testing the bindings and finding them firm, he looked around the dim room. Fluid from a medbag dripped into him through a patch on his left bicep. For a disorienting second, he thought he was back in the izzies’ clinic. No. This had the strange, sterile smell of a clinic, but it was a private room. There was a visitor’s chair. The window framing the moons on a patch of starry night had no grille to mar the view. His back wasn’t on fire from the whip, or the quick-heal bandages as soothing as brine on his ravaged hide. He reached for his talent, and it came in a sluggish trickle and a stabbing headache. With a gasp, Ian shut it down and let the pain ebb away, resting under the restraints. Floating in a soothing sea, he didn’t open his eyes until the door clicked. A tall and slender woman strode into the room with the grace of a dancer, and Ian forgot to breathe. A tunic in Scotian healer’s gold fell past her slim hips, belted over black trousers with the four-stranded azure braid of a Water adept. She came to his bedside, a smile turning up the corners of her wide, wonderful lips, dimpling her cheeks, crinkling the corners of her eyes—her large, luminous eyes, glimmering with brighter sparks of topaz and emerald in the softer glow of dark amber. Her nut-brown hair fell to the clean line of her jaw, framing her bonny face. Her perfect nose sat slim and straight between exquisite cheekbones. Her dark, winging eyebrows arched above her beautiful eyes. Ian’s heart pounded, and he stared, slack-jawed. She’s real. I didn’t really believe. But…oh, Trinity, she’s real. Which comes first for you – a character's looks, personality or name? : I think their situation comes first. I see someone in a lot of trouble, and then I discover who they are by how they respond to it. I’m not good at visualizing people, so I cast actors into the roles. Sometimes I change my mind if I see someone, in a movie or on TV, who just nails an aspect of the character; but Nathan Fillion was Tazhret from start to finish. Any tips for aspiring authors? : Don’t confuse writing with editing. Never shut down the little voices in your head when you’re in full-bore creative mode. Get it all out where you can see it. The time to challenge, cut, or flesh out happens in editing. If you had the power of time travel, is there anything you would go back and change? I wouldn’t go back. I’d go forward. Why/why not? : Because hindsight is 20/20, and I could see what kind of life I’d created through my choices, and maybe make better ones. What super-power would you choose? : The power of forgiveness. To really free yourself from other people’s worst moments, ill-wishes or outright malice is liberating. If you could have three wishes, what would they be? : As a person: That I become who I am meant to be; that I help others become who they are meant to be. As a writer: That I get out of the way of my characters and let them be who they are meant to be. Coffee, tea or wine? : Not coffee. Other than that, I’m pretty fond of liquids from tea to tequila. What is your favourite book? (aside from one of your own! ): Impossible to answer. ONE favorite book??? I could cheat and say “The Bible,” since there’s more than one book in there, and the stories are hair-raising, the poetry profound. But have you read Deuteronomy? Eye-crossing detail. Now, favorite author...I’d have to say Lois McMaster Bujold. She’s a master. Favourite genre and why? : Science Fiction, especially space opera. Because it’s about the possible. It’s almost like having that time machine set on “forward,” taking you to places where you can see choices played out on the personal and societal level. In character-driven SF, moral choices in the face of temptation (i.e., “character”) and the human heart matter. Favourite colour? : When I was a kid, my two favorite colors in the crayon box were teal and magenta (which I thought was “magneta”). I still like vibrant colors: green, gold, orange, red, purple. Just throw me some beads and call me Mardi Gras. Upcoming news and plans for the future? : Finish editing Web of Destiny, the sequel to Forge. I’ve never written a sequel before, and I learned a lot from my editor on Forge, so revising Web of Destiny got off to a slow start. And then I had to stop long enough to explain why two of the characters hated each other so much, and that became a prequel novella, Seeds of Enmity (available on Kindle), which sidetracked me from WoD for a while. But I’m back to Web of Destiny now, and happy (at last) with the direction the book is taking.